I've run a lot of 5ks in my life. I also ran that one 10k. What I've never done is run further than 6.2 miles....until recently. Running a half marathon has been on my bucket list for a while. I've attempted to train for one a few times before but have never gotten very far. Its a big commitment and life is hella-busy. Training is tough, its discouraging, the weather doesn't always cooperate and its easy to give up. But this time around, I'm sticking with it. That feeling of accomplishment I had after my 10k is something I want to feel again, and I'm ready to push myself to get there. 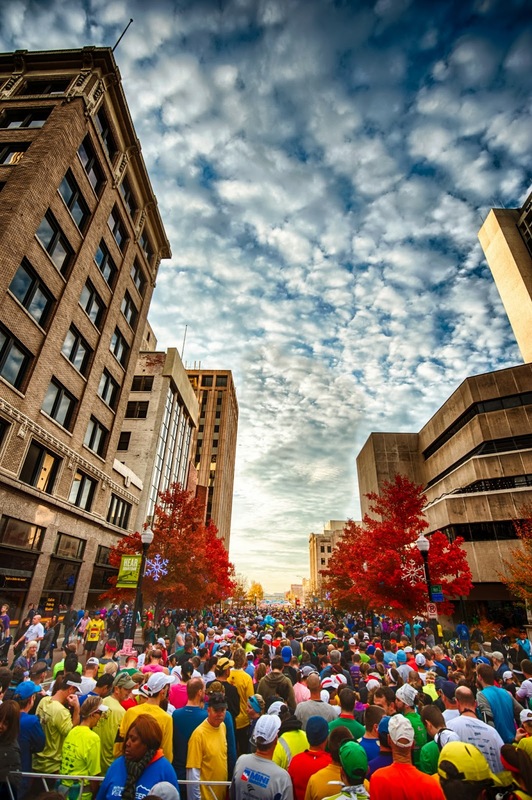 Sunday morning, Nov. 24, I'll be in this crowd of Route 66 Half Marathon Participants, lining the streets of Tulsa, Okla. Can you feel the butterflies? 'Cause I sure can. Some people might say 13.1 miles is crazy......but its only half crazy. One would assume that being on the upward side of 5'9" with an athletic build that I would be a fast runner. Those people are wrong. I'm not a fast. Heck, I run slower than AOL in '99. I blame my Ronald McDonald sized feet for being too large to pick up properly. I run like a weirdo (seriously, my form is all jacked up), I struggle with Sports Induced Asthma, and my knee likes to pop out of place on the reg. I am also very good at coming up with 1,000 reasons why I shouldn't run. But, I have the guts to get out there and try, to overcome my fears and struggles, to push myself and to be a better me. Regardless of what my time is, it will be a new personal record because it will be the furthest I've ever ran. And that, my friends, is a huge accomplishment. "Give a girl the right pair of shoes and she can conquer the world." Now that its in writing, I can't turn back....and that is a tad bit scary. Luckily I have a fancy new pair of Brooks running shoes, courtesy of Keep It Local and Red Coyote. I also have a large selection of running headbands and a cute, cold weather zip up for those brisk fall runs in the near future. In the right shoes and outfit, I am invincible - Carrie Bradshaw would back me up on that. Here's to 13.1, ya'll.....wish me luck!